The bedroom is one of the most important rooms in the house—it is usually the space where residents spend the most time. These attractive rooms combine a modern design sensibility with relaxation-inducing furniture pieces. 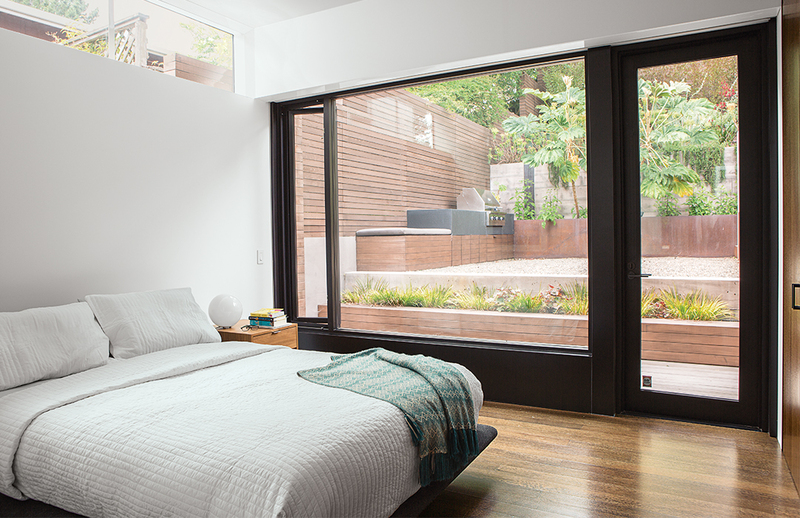 In a renovated San Francisco home, the master bedroom’s clerestory window provides morning light while allowing for privacy from the neighbors. The Siena bed is by Naoto Fukasawa for B&B Italia, the side table is Room & Board, and the globe light is vintage. The western-facing master bedroom of this Brooklyn loft captures stunning sunsets from its wall-to-wall windows. In a minimal Slovenian abode, the simple yet spacious master bedroom opens up to a private terrace. This New Zealand master bedroom has a big surprise: it features an unobstructed door-sized opening onto the double-height great room. A pair of Tolomeo classic wall lamps from Artemide hang next to the bed. A remodeled 19th-century farmhouse finds ways to blend old and new. The wide-plank floors were reclaimed from the original farmhouse during the demolition process. A wood-lined Australian dwelling features a simple bedroom arrangement. The rocking chair is by Thonet and the bespoke rug is by Armadillo & Co. In a Montreal triplex, a bedroom includes an armoire by Kastella and a chandelier by Lambert & Fils. A portion of the ceiling was pared back to expose the underside of the original roof. The gable roof and balcony of this San Francisco residence foster the illusion of generous space. A free-standing wall divides the sleeping space from the bathroom. Arne Jacobsen wall sconces illuminate the master bedroom of this midcentury Portland residence, which is furnished with a Case Study bed and a Series 11 6 Drawer Console by Blu Dot. A board-formed concrete headboard adds texture to this São Paulo sleeping space. Each bedroom of this rural Slovenian home is designed to replicated a mini house, and follows the roof's pitch. A skylight lets in light. A custom unit made of white-painted MDF panels provides necessary storage. A small, cramped closet in a renovated Seattle attic was replaced with a wardrobe that is partially obscured by a slatted wooden screen. Concrete block wraps this midcentury bedroom in Napa, California. A Margaret Kilgallen print joins a Brionvega Algol television, lamps from Patricia Urquiola and Pablo, and a Hans Wegner chair. In the home of a musician in Kansas City, the sleeping space is set off with curtains instead of a door to foster an open feel on the ground floor. Bedding from West Elm sits atop a platform bed, also from West Elm. This London loft features a minimal sleeping space arranged under a skylight. This bright Manhattan apartment is filled with graphic touches. Book jackets by Alvin Lustig and a vintage subway sign hang over a custom bed by Jeff Jenkins Design + Development. For a family with three young children, Brooklyn-based furniture company Urbangreen devised durable, modern bunk beds. In addition to incorporating two twin-size and two full-size beds into the 240-square-foot room, the designers needed to wedge in two desks and ample storage.